Discover Waltham Forest’s amazing programme of culture and get ready for Chingford May Day Fayre for a procession on bicycles through the urban woodland to celebrate the International of Day of the Worker. Waltham Forest is the first ever London Borough of Culture, giving locals the chance to experience world-class culture on their doorstep. Their 2019 programme is packed with stand-out projects and unmissable moments that will capture the attention of the whole city. Waltham Forest is the first borough to be awarded the title - for 2019, followed by Brent for 2020. What is London Borough of Culture? The Mayor’s London Borough of Culture award will bring Londoners of all ages and backgrounds together. It will put culture at the heart of local communities, where it belongs. It will shine a light on the character and diversity of London’s boroughs and show culture is for everyone. Now more than ever, the Mayor wants Londoners to get to know each other and feel part of our great city. Thanks to this new award, all Londoners will now have the chance to be part of something extraordinary. In total, 22 boroughs submitted bids in December 2017 to be named London Borough of Culture. In February 2018, Waltham Forest and Brent were awarded £1.35m of funding to deliver a programme of ambitious cultural activities celebrating the unique character of local people and places. Waltham Forest will be the inaugural London Borough of Culture in 2019. They will deliver a year of exciting cultural activity across the outer London borough, and have an ambitious target of getting 85 per cent of households to participate, attracting half a million visits. More than 12,000 local people backed Waltham Forest’s application from across the borough’s diverse communities. Drawing on this diversity was a key strength of Waltham Forest’s bid. Activity is planned from Walthamstow to Epping Forest, Chingford to Leytonstone in a borough-wide celebration of culture, which will capture the attention of the whole city. The winner of 2020 London Borough of Culture is Brent. The voices of young people take centre stage in Brent’s bid. During 2020, the borough will establish a new trust for delivering culture in the area with 50 per cent of the trust’s board being both from the local community and under the age of 30. Rather than adopting a top-down approach, the borough is working with young people to explore what culture means to them in the 21st century and allowing them to directly influence the design of their London Borough of Culture programme. 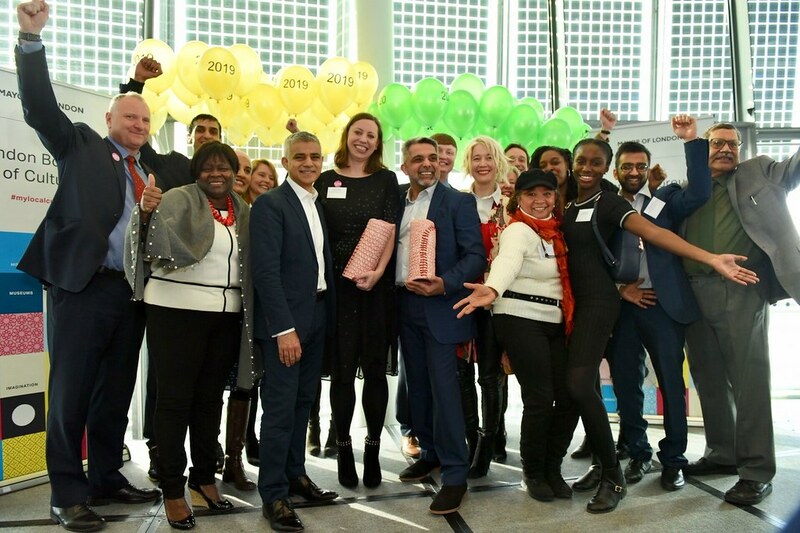 There are two types of awards for London Borough of Culture; the major awards for 2019 and 2020 and the Cultural Impact Awards. Cultural Impact Awards were given to boroughs for exemplary individual projects highlighted in their applications. Six boroughs won for projects that will take place between 2018 and 2020. Barking and Dagenham wants to create a new policy for the role of culture in social care settings. It will bring together artists and young people in social care, and explore themes of work and employment with local residents. Camden Alive will establish a virtual Camden People's Museum, whereby residents will be proud creators of the boroughs cultural life, enhancing feelings of neighbourliness and identity. Kingston will create a live music circuit connecting venues, artists and promoters, and build on the area’s rich music heritage. Lambeth will inspire the next generation of creative leaders, supporting residents from BAME communities to build careers in the arts. Bringing together leading grassroots organisations and major cultural institutions to help. The Albany and Entelechy Arts will launch a Festival of Creative Ageing in Lewisham. This will harness the power of culture to help people live longer, happier, more independent lives. The centrepiece will be an immersive theatre experience devised with older residents. Merton is taking an innovative approach to establish a new local cinema in Mitcham. By demonstrating resident demand through a new film festival curated by local people, the borough will make the case for future investment. Learn about some of the new projects that we are developing.